When i arrived at Ilembula.i had a very bad surprise : the 3 elements triband was disassembled!!!!! 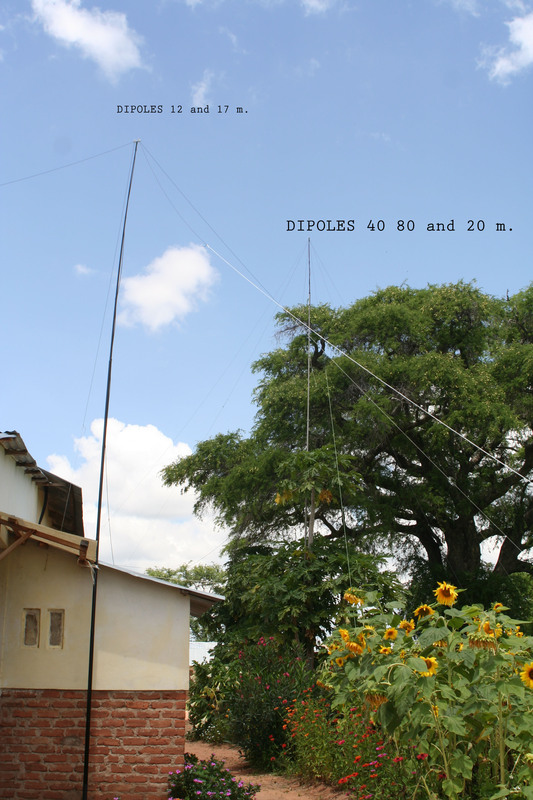 With Faustino IK2SAU i had prepared some dipoles and so i had to use this setup,hi..... The tx was a FT 100 by Yaesu,my keyer ETM 3,home made interface for RTTY and a laptop with the software QARTEST that works very good . Unfortunately a friend of my group was snoring strong and had to sleep alone in the room where i have the station.So,i could not use it during the night and i made a few qso on 40 meters and none in 80 meters. The time i had to operate was not too much but at the end i made about 3800 qso and about 350 qso also in WPX SSB Contest.